Pitmasters Fan The Old-School Flames Of All-Wood Barbecue : The Salt Barbecue lovers once feared that wood-fueled pits were endangered. But as appreciation of this traditional cooking method grows, pitmasters are finding wood-only is good business. 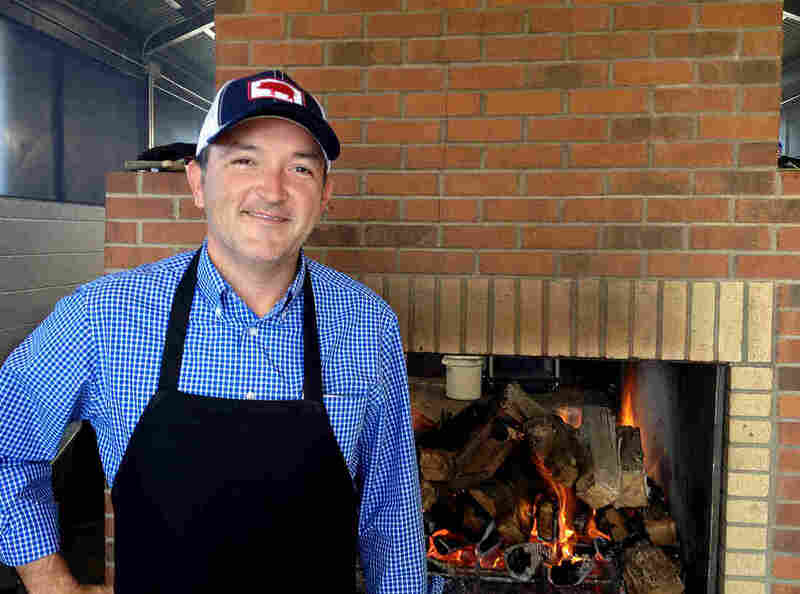 Sam Jones, 34, opened Sam Jones BBQ in Winterville, N.C., in early November. He's part of a trend of young pitmasters embracing all-wood cooking. On a recent Saturday, well past lunchtime and nowhere near dinnertime, a line of about 25 patrons ran along the length of a restaurant. Outside, a dozen cars idled at the drive-thru window. By dinnertime, the line had tripled. Sam Jones, the owner of Sam Jones BBQ, says he expected people might line up to try his whole hog barbecue, ribs and sides when he opened here in the small town of Winterville in eastern North Carolina. But "we under-estimated. We have nearly doubled [the revenue] we projected," says Jones, who talks with an easy North Carolina drawl and enjoys a passing resemblance to Kevin Spacey. Jones is 34, and he's joining a trend of young pitmasters embracing all-wood cooking as a means of restoring what they see as barbecue's authenticity. These new traditionalists operate in cities from New York to Seattle. And the instant clamor around the opening of Sam Jones BBQ is helping to reinforce that the old ways of barbecue are not only not dying, they are roaring back. "What I call it is not compromising," Sam Jones says. "We've added some things. But we still sell pigs cooked over wood, just like Pete did." To understand the significance of Sam Jones BBQ, you have to understand the place in the barbecue firmament. And you have to start with barbecue's place in the Tar Heel state. Aficionados regard North Carolina not only as a capital of barbecue, but a cradle of the cuisine. It is as central as basketball to the state's identity. But it seems North Carolinians as well as Americans in many other states have little to fear. The sweet smoky aroma that once hovered almost exclusively above rural shacks in the South is these days commonly sniffed in fast-casual barbecue restaurants up north and throughout the land. Its astonishing growth has been aided in no small measure by wood-enhanced gas and electric ovens. Jones is a scion of barbecue royalty. In 1947, his grandfather, Pete Jones, founded the Skylight Inn in the tiny eastern North Carolina hamlet of Ayden, about a 20-minute drive from Sam Jones BBQ. The Skylight is widely considered one of the best barbecue restaurants in America and has a James Beard America's Classics award to prove it. For years, Jones has managed the Skylight. He still does, even now that he has his own restaurant. "We're not competitors," he says. "We're family." The Skylight's approach to barbecue is downright fundamentalist. The restaurant, crowned with a rough facsimile of the Capitol dome to indicate its self-proclaimed primacy in the barbecue world, slow cooks whole hogs over mostly oak embers, as it has done for nearly 70 years. It also proclaims its philosophy on a billboard in the parking lot that Pete, who died in 2006, erected back in the '90s: "If it's not cooked with wood it's not bar-b-q." The meat is hand-pulled, then chopped to a mince with cleavers, not ground up in a machine as is often done these days. Sides? Cole slaw. That's it. No mac'n'cheese, French fries, baked beans or potato salad. No beer. No ribs. No waiters. But Jones believes that times are changing. "People want choices," he says. At Sam Jones BBQ, the changes are sweeping. There's beer. And pork ribs. Even waiters – sort of; after ordering at the counter, servers bring the food to a customer's table. And there are sides – among them, mac'n'cheese, French fries, baked beans and potato salad. 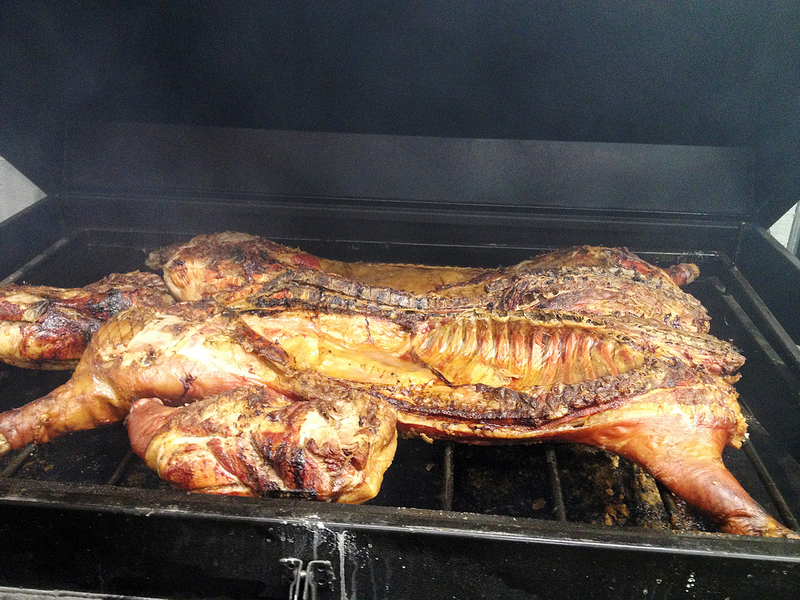 But something isn't changing: whole hog cooked over hardwood embers. "What I call it is not compromising," Sam says. "We've added some things. But we still sell pigs cooked over wood, just like Pete did." All-wood cooking is on the rise in North Carolina. In 2013, John Shelton Reed, who wrote Holy Smoke: The Big Book of North Carolina Barbecue with his wife Dale Volberg Reed and William McKinney, co-founded True 'Cue with barbecue blogger Dan Levine (aka Porky LeSwine, who operates bbqjew.com). Concerned that wood-fueled pits were an endangered species in North Carolina, True 'Cue certifies restaurants that still cook with wood by providing a plaque to display in their establishment. Their estimate of wood-cooked barbecue restaurants in the state is 60, double the estimate from several years back. Newcomers include The Pit in Raleigh and Durham, The Pig in Chapel Hill, Hillsborough BBQ Company in Hillsborough, and Buxton Hall in Asheville. Picnic is scheduled to open in Durham in January. True 'Cue has since begun operating in South Carolina and hopes to take its campaign nationwide. Slicing brisket at Franklin Barbecue in Austin, Texas. The new-found interest in all-wood barbecuing has a lot to do with the success of Aaron Franklin, owner of Franklin Barbecue. The new-found interest in all-wood barbecuing has a lot to do with Aaron Franklin, owner of Franklin Barbecue in Austin. Although Texas has long enjoyed a robust all-wood barbecue culture, gas has crept into the Lone Star state over the years, with several "gassers" making Texas Monthly's 2013 "50 Best BBQ Joints" list. "I think the number of people sticking to traditional methods – all wood and all that – it's getting few and far between," Franklin told me in an interview for the Washington Post in August of 2011. By then, Franklin had succeeded by going against the grain. He started out experimenting with brisket at backyard parties, opened a barbecue trailer in 2009 and a bricks-and-mortar restaurant in March 2011. Just three months later, in June, Bon Appetit proclaimed Franklin Barbecue the best barbecue in the country. At the time, Franklin was 33. Earlier this year, Franklin's dedication won him a James Beard award for Best Chef: Southwest, a first for a barbecue pitmaster. His success has functioned as a sort of barbecue big bang, creating an ever-expanding universe of wood-only barbecue joints in Austin and beyond. The all-wood fires have raged across the country, from Salvage Barbecue up in Portland, Maine, to Cracklin' BBQ in Savannah, Ga., out to Jack's BBQ in Seattle. In Washington, D.C., a graduate of the Culinary Institute of America named Rob Sonderman opened his highly acclaimed speck of an all-wood place, called DCity Smokehouse, in 2013. "For me, [using an all-wood pit] was more about being able to say I could do it and knowing in my heart that we were doing all wood," Sonderman says. "For me, it's a matter of pride." 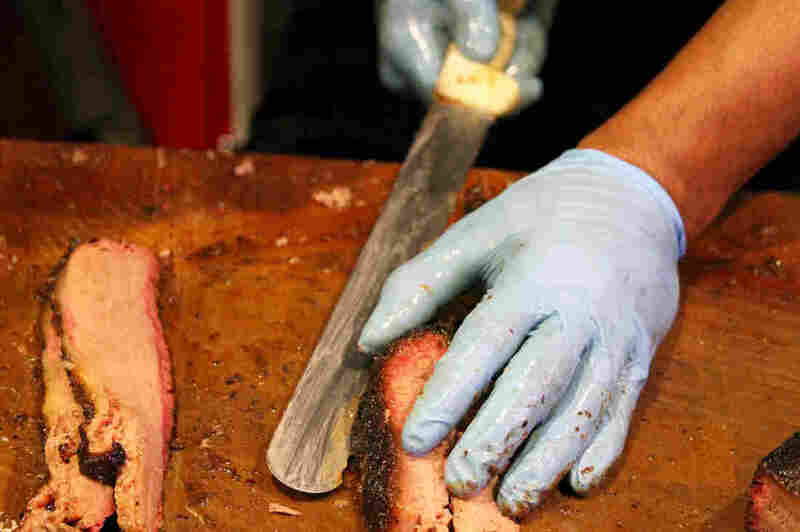 Meanwhile, New York City has been lighting its own all-wood fires at places like Brisket Town, Hometown and Fletcher's "I like tying myself to history," says owner and pitmaster Tyson Ho of Brooklyn's all-wood Arrogant Swine. "If you are cooking meat in a way that extends tradition in American cuisine, you are offering something." While Sam Jones is hewing closely to tradition, he and his operating partner, a longtime friend named Michael Letchworth, are also evolving the family brand. The Skylight cooks its pigs in old brick pits. At Sam Jones BBQ, they're smoked in custom-made metal smokers that hold the heat better, thus requiring less wood. Four generations of a family from Ayden, ranging from the 78-year-old matriarch, Peggy Stokes, to her 11-week-old great-grandson, Myles, sit at a long table in the back. The clan has eaten at Skylight many times over the years and has just polished off their first meal at Sam Jones BBQ. Their verdict? Thumbs up, primarily because of the changes. "I like beer," says Matt Stokes, 28, Myles' dad. "Barbecue places around here don't usually have it." "I don't eat meat," says Matt's wife and Myles' mom, Christie Stokes, 26, "and I like it because they have things I can eat." As for any statements his restaurant may make about barbecue in America, Sam Jones leaves it to others to decide. "We're just people doing what we like to do," he says. Which, these days, is keeping the proverbial fire of tradition burning, without losing sight of the future. Jim Shahin writes the Smoke Signals barbecue and grilling column for the Washington Post. His work has appeared in Texas Monthly, GQ, Southern Living, Esquire.com, Bon Appetit.com and elsewhere. He teaches magazine journalism at the S. I. Newhouse School of Public Communications at Syracuse University.